Neoprene is very buoyant, helping swimmers to stay afloat. 2mm Neoprene for a really comfortable fit. Full Length Design For Extra Warmth. Fit great! kept my kiddo warm too! my daughter is 2-3 yrs and wears 3T clothes and i do believe she will be able to wear again next year! 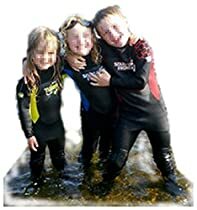 Nice kids wetsuit. Seems fairly durable. My 12 year old may be a little big, but it seemed tight on him. It fit my 9 & 10 year olds just fine. My son is 8 years old and he loved it when we floated down the river.